When you think of the Seattle area, you probably imagine mild temperatures and overcast skies. But when the summer heat reaches the high 80's and 90's, Pacific Northwesterners who are accustomed to mild weather, will be desperate to escape the heat. 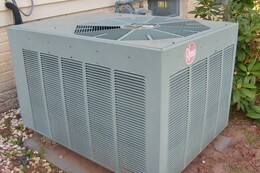 Keeping your home cool for the summer months is easy with help from Northwest Mechanical. Our HVAC experts have thirty years experience designing sustainable systems that keep your home comfortable in the most energy-efficient manner possible. Complete home air conditioning systems can be engineered to adapt to the unique micro-environments of your home and your property. The control panels for these systems are increasingly smart, allowing you to fine-tune your system and learning, over time, how to keep your family comfortable while still maximizing power savings. Whether you need repair of your ductless single-head system, or a service call for a modern, full-home HVAC system, the experienced technicians of NW Mechanical are available to help 24 hours a day. Troubleshoot and repair systems installed by someone else. Northwest Mechanical offers maintenance on all types of residential and commercial heating, plumbing, solar and geothermal systems. We are recognized as an expert service company for boiler and radiant systems and can keep your system running smoothly and efficiently for your comfort. Additionally, we offer a SERVICE PARTNER PLAN that takes the worry out of Annual Maintenance and includes distinct Benefits. You will receive a 15% Discount off the bottom line for our Heating, Plumbing and Solar Service for as long as our Service Partner relationship remains in effect. Plan members are our Priority and jump to the head of the line when they call! This applies to routine and emergency calls. If you are in need of an Emergency Service, no matter what time of day or night you call, you will receive a 15% Discount off the emergency fee and you will receive the same quality service as always but pay only from the Service Partner pricing menu! We will call you annually to set up your tune-up, so you don’t have to worry about it. Your Service Partner agreement can either be transferred to your new home, or to the buyer of the home you are selling. Your choice!